Do you have bottles associated with unhappy memories? I do. Not many thankfully, though 1988 is, or more accurately was, one of them. February 2003 and my hot new girlfriend is taking me for a candlelit dinner at a chichi restaurant in Islington. The ambiance is perfect. The food is divine. The titular wine is showing well. Unfortunately I am suffering a migraine from hell. In fact, it feels as if the devil himself is searing the inside of my head with his white-hot pitchfork. I struggle through the evening, though my attempts to shrug it off are in vain and we leave early. Fast-forward 16 years and I am lunching at Noble Rot restaurant with co-proprietor Dan Keeling. Granted, the ambiance is less romantic however a) there is no white-hot poker pressing against my skull and b) Mr. Keeling is kindly pouring the exact same Saint-Émilion. Although the 1980s were comparatively underwhelming for Ausone, this bottle is among the most enjoyable that I have encountered from that period. The 1988 Ausone shows extremely well after 31 years. It remains lucid in colour with little ageing on the rim. The bouquet is clean, with so much fruit that it comes across more like a 1989 than a 1988. It sports none of the leanness or greenness one sometimes finds with Right Bank 1988s, just lovely black plum and mulberry fruit, hints of allspice and iodine. The palate is medium-bodied, well balanced and underpinned by slightly brawny tannins. However this is compensated by endearing plummy fruit, truffle and a subtle marine influence towards the finish. Consumed over the course of a 2-3 hour lunch it improves with aeration and it never loses an ounce of joie de vivre. 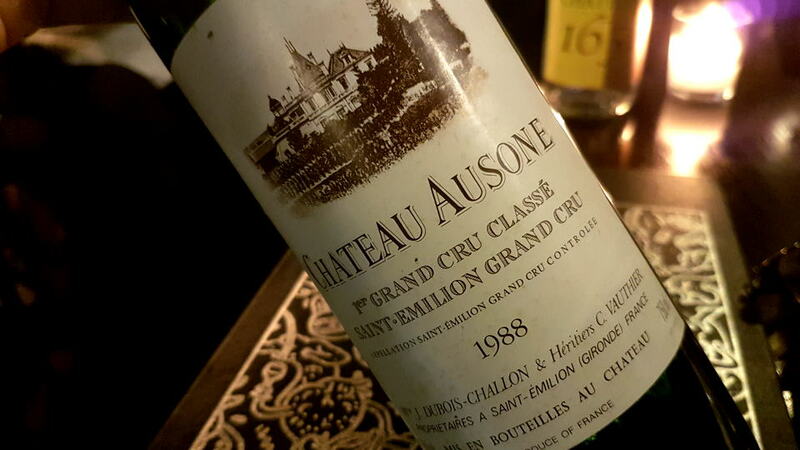 No, the 1988 is not the most complex Ausone, however, it is certainly the most pleasurable from the decade. Drink this now as it will not improve further, but well-stored bottles will give another decade of drinking pleasure. 92/Drink 2019-2030.